UPDATE: Nokia just confirmed that Symbian Anna is to come "as standard" on newly shipping Symbian^3 phones like the Nokia N8, E7, C7 and C6-01 in the next months. You'll - of course - be able to download the update for your Symbian^3 handset. Espoo also assures us that Anna is just the first of many upcoming updates for the "burning platform." With that news the fire in the Symbian camp might just have died down for a while. Minutes before the start of the official Nokia event in London, the Finns have uploaded a promo of the long-awaited new version of Symbian^3: Symbian Anna, previously known as the PR 2.0. The video also officially confirms the Nokia X7 and Nokia E6, which are given a kickstart as they will be the first phones to support the latest Symbian^3. It's not only about the looks, even though Anna has a well-honed new set of icons, but mostly about two features long due for an update. You guessed it right – with Anna you have an all-new web browser and portrait QWERTY input. The handsets will also come with an enhanced version of OVI Maps, Nokia's mapping service, which is expected to come to future Windows Phone 7 handsets. 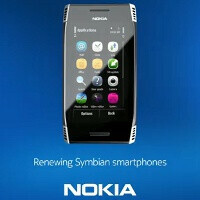 Could this be enough for the company to push the next 150 million Symbian handsets? We leave this to your discretion, so sound off in the comments below! X7 4" display with 360x640 CBD ?!!!! E6 2.8" display with 460x640 ?!!!!!!!!!!! I'm glad I waited to get the C7/Astound; I'll be getting the X7 or the N8 if it drops in price instead! Looks great, Nokia should've let AT&T pick up this handset for their line. It just worries me that since Symbian is a "burning platform" then why would people want to buy a phone with an OS that is on its way out? I feel Elop's choice of words were none to good.